I came home from town to a nice surprise, a bag of dill and some pickling cucumbers! A neighbor had dropped them off for our family. I was so excited that I was going to be able to put up some pickles! It is a crazy week with getting ready for fair and I wasn't planning on canning, but I appreciate the gift and look forward to some yummy pickles! I got out my trusty Betty Crocker Cookbook for my favorite Garlic Dill Pickle Recipe, only to find that page missing. I browsed online and could not find one that resembled it. I did find recipes with pickling spices, onions and peppercorns, but not a simple garlic dill recipe. Finally, after an hour of looking I found it! Mix water, vinegar, and pickling salt in stainless pot and heat to a boil. Place 2 clove garlic and one head of dill in each quart/canning jar. Pack cucumbers in jars (whole or sliced). Fill Jar with Brine , leaving 1/2 inch head space. Wipe jars and rims. Put on lids. Process for 15 minutes in a Water Bath. -It is best to use cucumbers the day they are harvested. If they cannot be processed at that time, store the cucumbers in the refrigerator. -I usually leave the cucumbers whole, but will slice them if they are little larger. -Cut off the blossom end of the cucumbers. -I wait three weeks before using the pickles. If you are not familiar with the basics of canning this site is a great resource and can help get you started! Sandra, they look so good. I made refrigerator dills a few weeks ago, but the fact is, we don't eat that many pickles here... I do like them on occasion though. I seen recipes for the refrigerator pickles, I was tempted. I chose an old stand by. My girls love pickles! :) and these have been a favorite. These look so delicious!! I may have to try them. We still have tons of cucumbers here, but I'm getting tired of looking at them. I just love garlic and I know this will taste so good! Thanks for sharing! It was a mixed blessing when she dropped them off! 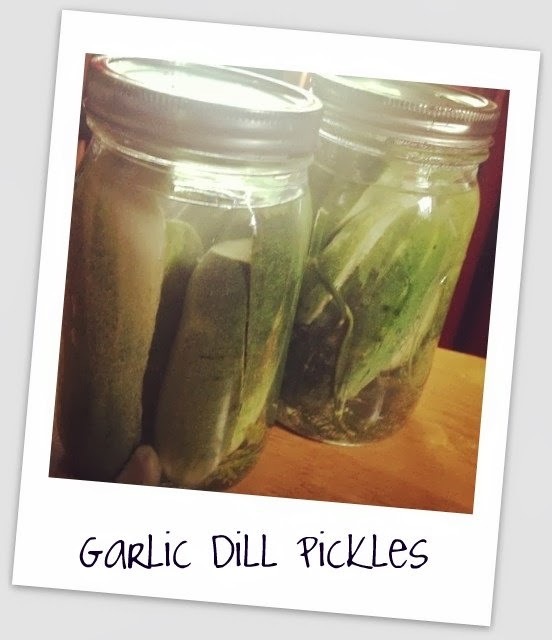 :) Thankfully, it is aquick and easy pickle recipe! Thank you for the recipe. I have been looking for a new one. Do the pickles stay crisp when you water bath them? Crisper than other pickle recipes we have tried. Cutting ithe blossom ends and using freshly harvested cucumbers help. I also chilll the pickles before eating. Thank you for the recipe and the information. I look forward to trying them. Pinning to try this year, looks like I'm going to have a good crop of pickles! It has worked great for us when we have had a lot of cucumbers to put up! I need to try this. I just did a batch of fermented pickles which really turned out tasty when using cabbage and beets but I didn't like how it was for pickles. Still looking for that crisp pickle out of the can taste. I'll have to give this a try.